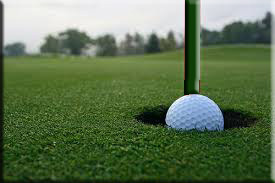 what do you think are the chances of hitting a hole in one? according to golf digest, it’s one in 12,500 – which is precisely why i don’t golf. i will never understand why people think it’s so much fun to hit a ball around the grass to get it into a hole that it would take 12,500 swings, to actually achieve 100% success, just one time. . . . but people do love it – and my mom is one of those people – and today she got a hole in one! and because this is not her first hole-in-one, she is eligible for the multiple hole-in-one winner gold star award!